Kids Lunch Box Recipes. 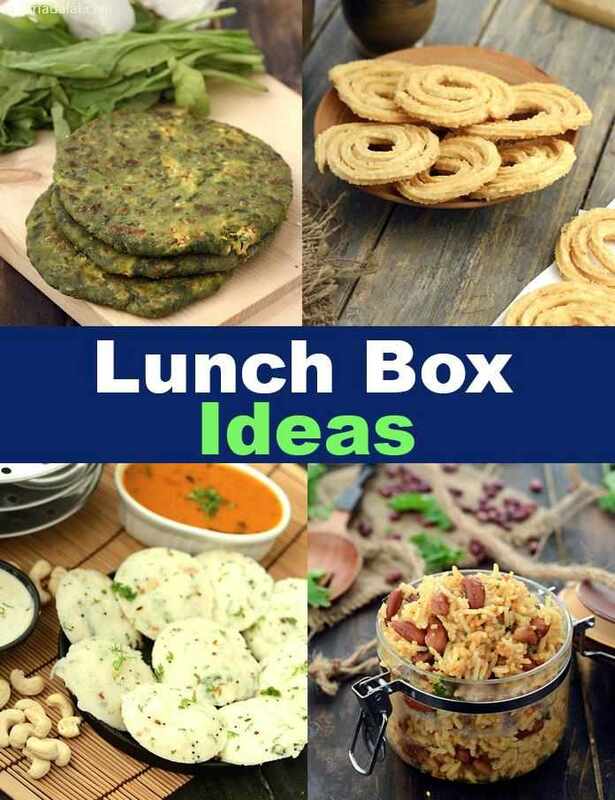 Kids Lunch Box Indian Recipes. If the question of “What to pack in your kids lunch box?” worries you every single morning, put aside your woes! Really, on a busy morning, the lunch box is what worries most people. Apart for packing something interesting for their kids, they even have to carry food to work. While adults will somehow adjust with the same food in their lunch box every day, understanding the difficulty of preparing and packing food amidst the bustle of the mornings, kids are not like that. They tend to get bored, and after a while they start bringing the food back home without finishing it. This article will ensure that kids do not have to settle for boring lunches any longer! We have put together a collection of lunch menus, 7 lunch ideas – from Monday to Friday – which will remain nice and fresh in your lunch box for a long time. You can confidently pack these, without worrying about whether they will become stale or soggy by afternoon. Quick recipes like Sooji toast take hardly any time to cook. You just have to combine all the ingredients, place it on a breads slice and cook it on the tava. Also, Potato Cheese Grilled Sandwich, Pizza rice, Sevaiyan Pulao are other easy lunch box recipes that do not require major preparathion or big list of ingredients. Here is a sample week of Lunch Box ideas. Start your week with a sumptuous lunch of Stuffed Spinach Paratha and Masala Corn. The peppy flavour of this meal will perk up your mood and prep you up for the week ahead. On Tuesday, go for Quick Rava Idli and Coconut Chutney. It is really easy to prepare and will not be a hassle to prepare in the morning. At the same time, it tastes awesome! A colourful and crunchy treat is just perfect for the middle of the week, as it will put you back on the right track even if you have had a busy or stressful week so far. So, on Wednesday, go for the Cauliflower and Green Peas Stuffed Beetroot Wrap and the Roasted Poha and Oats Chivda. Not only will you enjoy the meal but also get a lot of compliments from your kids and others for the wonderful treat you packed them. Thursday is the time to settle down and relax – you have crossed the major part of the week and the weekend is inching closer now. How about some homely and satiating Rajma Chawal, coupled with the popular South Indian jar snack Murukku. You can prepare crunchy, savoury Murukku in advance and store them in an airtight jar, to enjoy whenever you want. Just pop some into the lunch box in the morning! Other Indian recipes for kids lunch box are Baby Corn and Capsicum Rice, Cheesy Thepla Potato Wrap, Pav Bhaji which are some mouth-watering , sumptuous treats. Friday is the time to unwind, albeit in an exotic and exciting way! Pamper yourself with a lunch of Creamy Pesto Pasta. The luscious mouth-feel and awesome flavour of this pasta is sure to bowl you over. Indeed, you and your family are going to become the object of everyone’s envy, what with wonderful meals in the lunch box, every single day of the week. A good lunch in the tiffin box is worth the effort, because it will reboot your day and make you as energetic and happy as ever. So, relax and gear yourself up – we’ve done the planning, you do the cooking, and watch happiness blossom! Explore more lunch box recipes for kids from our collection given below. Enjoy our Kids Lunch Box Recipes. Kids Lunch Box Indian Recipes and other kids related articles below. Wholesome and filling, the Panchamel Khichdi is more than a meal in a bowl! With rice and four different dals, cooked along with a basketful of crunchy vegetables, tomatoes and spice powders, this Khichdi features myriad textures, flavours and colours, making it a delight to behold and relish.